There is a place where capes and masks are the norm, where comic books and superheroes are the topics on the tip of everyone’s tongues and where stormtroopers haggle over the price of a laser blaster. That place is WonderCon. This past weekend, the Moscone Center in downtown San Francisco hosted the 25th annual WonderCon, one of the most popular conventions for comics and new art in the United States. With a mixture of panels with prominent individuals in the business, sneak peeks into film and television adaptations of classic comics and an exhibition hall with hundreds of booths, Wondercon is a must for San Francisco comic book fans. Part of the WonderCon experience, and a major draw for many in attendance, were panels highlighting important figures and companies that help define the comic book scene. These panels included everything from “Life after trauma: To Be a Superhero or a Supervillain,” which featured a psychiatrist discussing the affects of post-traumatic stress disorder on the development of heroes and villains, to “Webcomics: New Horizon,” which discussed the affects of web comics on the industry. Dan Dedio, co-publisher of DC Comics since February 2010, said in a DC Comics panel that he feels as though the panels were meant to be an interaction between publishers and fans. During the panels, fans continually asked publishers about comics and books that were cancelled in 2010, but Dedio said it was a waste of energy to focus on what is gone. The convention was also home to many other famous figures such as Joe Quesada, chief creative officer of Marvel Entertainment; Robert Kirkman, writer of the Walking Dead comic book series and prime contributor to the television version; and Max Brooks, author of “The Zombie Survival Guide” and other zombie literature. The main exhibition hall was a site to behold, with superheroes, supervillains and other assorted comic book and video game characters rushing from booth to booth to snag quality comic books and merchandise. The hall included more than 100 booths selling graphic novels, DVDs, original art, clothing and even plush toys in the shape of human organs. The exhibition hall was also center stage for famed personalities including the original Incredible Hulk Lou Ferrigno, Peter Matthew – the voice of Chewbacca in several projects, and Halloween icon and TV personality Elvira. However, the revelry was not only reserved for the regular conference attendees, but also the exhibitors and dealers who contributed to the creative energy that flowed through the Moscone Center. 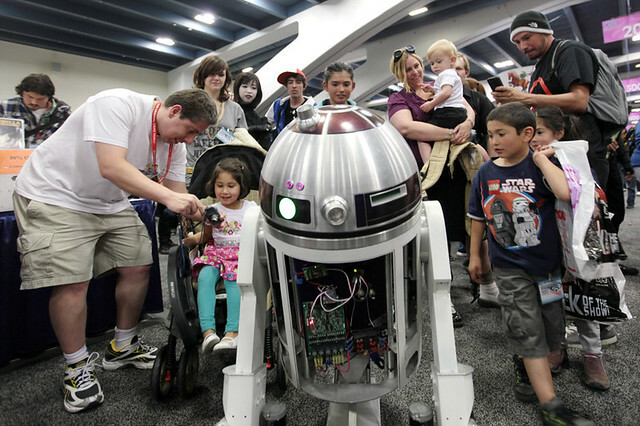 WonderCon – the creation of Bay Area retailers and comic fans in the late 1980s – also celebrated its 25th anniversary. The convention took place in Oakland for 16 years until Comic-Con took control in 2002 and had the event moved to the Moscone Center. However, the location is a minor detail; the celebrities, panels and the gathering of fellow comic-obsessed fans are some of the favored aspects of WonderCon. When a Boba Fett-Wolverine mixture can pose for a picture with a stormtrooper, a werewolf and the Flash, a community is naturally created. In the future, how do I find out where our roving Gator reporters might be? I was not only in attendance at WonderCon, but a first-time vendor as well… as an entrepreneur AND Dance student at SFSU, I would have loved the free publicity a quick question-and-answer might have given!